Halal version of Bak Chor Mee recipe. Sourish taste of vinegar with the punch from the chilli oil and the saltiness from the fried mince meat. 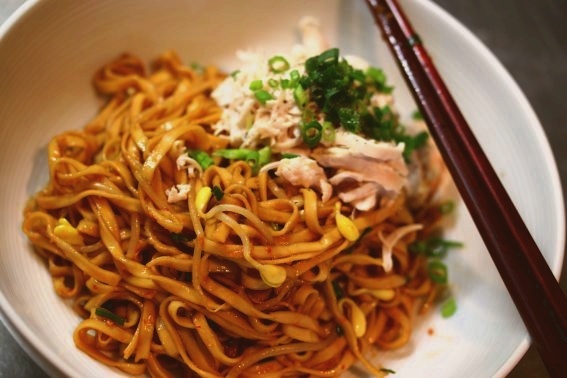 This Chinese noodle dish is very popular in Singapore which you can find in most hawker centers or foodcourts. Follow the steps and I do hope you enjoy the simple instruction given. Heat the pan with the tablespoon of olive oil. Add the garlic and fry till it just turns a slight tinge of brown. Add the minced meat and fry till cooked. Remember to break it up to small pieces. Soak the dried chinese mushrooms in warm water till completely soft for 15 mins. When soft, slice mushrooms to required thickness. Do not throw the water left after you take the mushrooms out. Heat 1 tsp of oil in a heavy-based pan. Add the slices ginger and fry till tender. Keep adding water (at least 2 more additions) and allow it to cook over low heat for at least 30mins. so that it’s soft and tender. and bursting with flavour! In a large bowl, put the chilli oil, oyster sauce, vinegar and fish sauce and mix till incorporated. Cook noodles accordingly and when done – plunge it into a bowl of cold water. This stops the noodles from cooking further. Then return to the hot water for a few seconds before putting into the serving bowl with sauce. Once the rice noodles are done, pour it into the bowl and mix it well with the sauces. Put a few pieces of the stewed mushroom in the bowl and top everything up with the minced meat. Note: Coriander can also be used for garnishing. i was looking for this recipe! thanks!